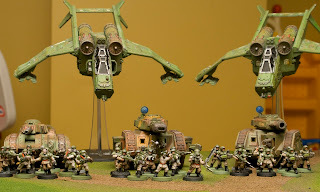 By now many, if not most of us have seen visions of 6th Edition 40K (via White Dwarf 390), and I for one love it. If you haven't had a chance to read through #390, its entirely devoted to 40K. Most of it is a paid advertisement for the newest edition with all of the eye candy you expect to see. But what has me excited about 6E? Forging a Narrative. Matt Ward talks on page 22 about telling a story in each battle. It isn't so much just winning a game, but being able to have your "unsung heroes earn honor and glory." Characters can pick out individual models, challenge other characters, and get a special ability before the game starts. But its not just new rules for heroes, its that Games Workshop has purposely strayed away from making a system designed for parity, designed for tournaments, designed to show off a players skill. Its clear, GW wants its game to show off GW. And you know, what? I'm ok with this. Having stayed away from the rumors for the last several months, I still wasn't surprised to see mysterious terrain in the new rules. But what did surprise me is the close tie-in with Citadel scenery and the new Fortification rules. Its a beautiful tie-in to allow your army to gain some very real benefits. It will be interesting to see how this affects play. Should I expect my opponents to show up with their own scenery? In other news, I've actually been working on my scenery for the last couple of weeks. Its kinda by mistake, but I'm eager to use some of my newly prepared Fortifications! Its hard to say before the rules come up, but WD suggests that Overwatch comes in two forms. Classical overwatch from days gone by (or standard in Special Ops: Kill Zone) and as a charge reaction. Finally! I've been asking for a rule like this for several editions. It definitely changes the landscape in Warhammer Fantasy Battles, and certainly my Imperial Guard hope it changes things in the far future. There are finally some real flyer rules coming out. I wish the rule "zoom" was there (it just sounds too silly), but at least a dude with a hand gun isn't going to easily be able to shoot my planes out of the sky while they are flying around. However, it seems (pg 67) that exploding vehicles deliver a staggering S10 hit to those inside! Yikes! I don't know now what this means for mech armies, but you know have to account for flyers in your games. Pre-measuring and random charge length didn't get much coverage, but seem to be in the rules. I'm all for these rules if it speeds up the game and avoid "cheating measuring" I've seen more and more the last year. My only fear is that it might actually slow down the game as some players will spend an eternity making sure models are where they want them. Hull Points are definitely in and look to replace the former vehicle damage chart and functions more like wounds on a standard IC. This might mean my Vendettas fire a full strength until its HP's are fully gone. I can live with that! Feel No Pain is now 5+, Reserves start on turn two at 3+, you loose your assault bonus with multi-assaulting units, Overwatch Flamers might do d3 wounds (not automatic), and most significantly wound allocation might be gone and replaced with nearest models take the first wounds. 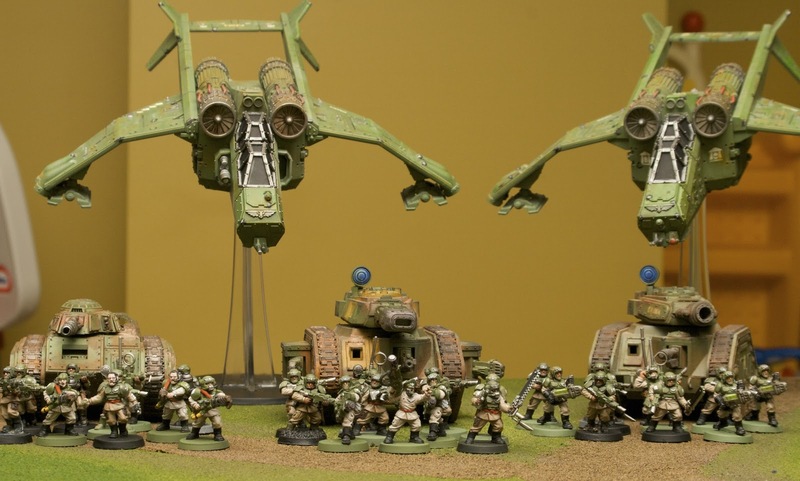 We will see on Saturday, but sci-fi war gamers have some exciting times ahead with an edition change.